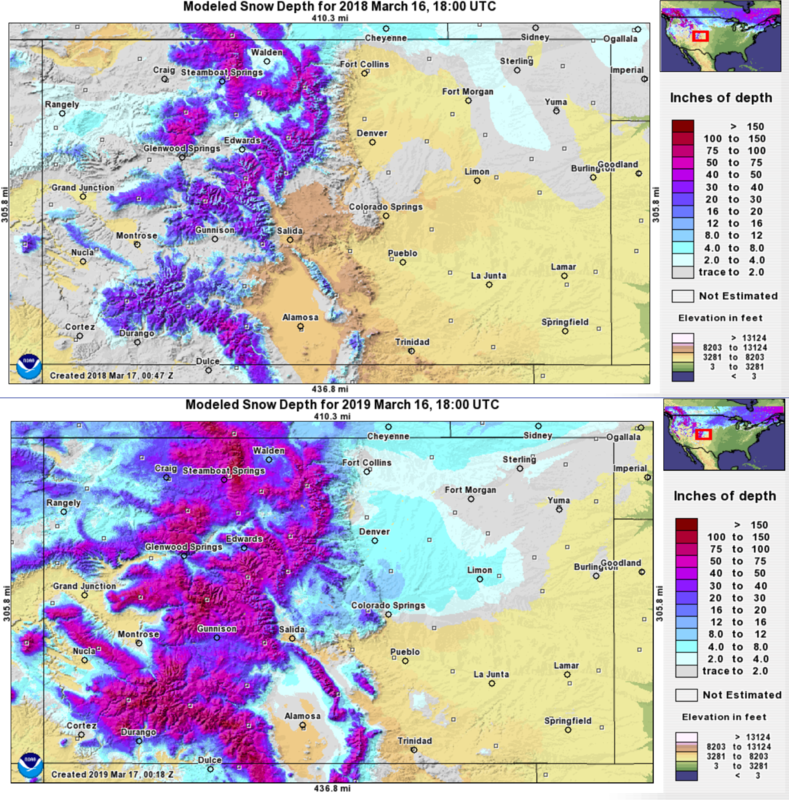 A well forecast snowstorm struck Colorado on March 13, 2019. NWS forecasts mentioned the blizzard and high wind potential over parts of the eastern Colorado plains days in advance. GOES-West water vapor imagery was utilized by forecasters to track the relevant features leading up to the event, and assess model analyses and forecasts. Forecast models had a great handle on the evolution of the system from its early stages. Water vapor imagery was also used on social media to aid in messaging about the incoming storm (Figs 1 and 2). This type of messaging not only engages “weather nerds”, but also helps to capture the public’s attention in a unique way, and educates them on a tool used by forecasters that many are not familiar with. On March 10, the main trough was already off the California west coast, pumping moisture into the southwest US (Fig 1). By March 12, apparent in water vapor imagery were the key features that would come together to develop an intense cyclone (Fig 2). 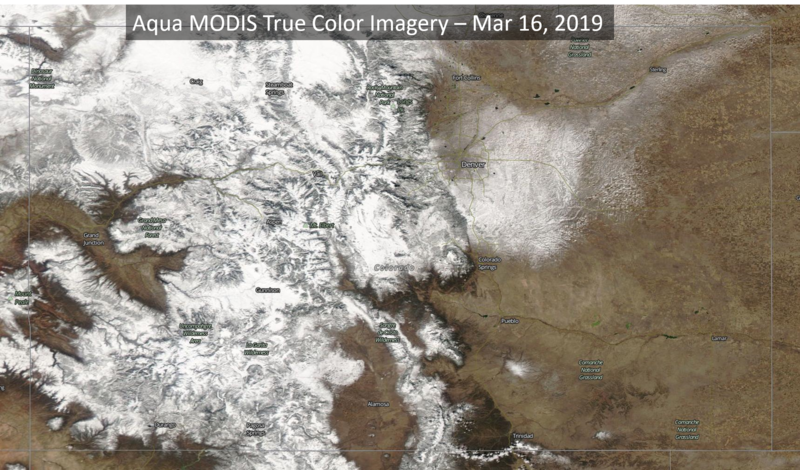 As forecast, the storm caused widespread blizzard conditions from Colorado Springs north, strong winds elsewhere across the eastern Colorado plains, and snow in the mountains. In fact, the Colorado Springs airport recorded a 96 mph wind gust, a record for the airport (data preliminary). Additionally, Lamar ASOS recorded a (preliminary) record low pressure for the state of Colorado of 970.4 mb! GOES-West water vapor imagery showed the rapid cyclogensesis that took place as the storm advanced across southern Colorado from the evening of the 12th through the 13th (Fig 3). 1-min imagery from GOES-17 (per BOU request) was available over the region to aid forecasters in detecting and tracking storm details, particularly convective elements and areas of potentially enhanced snowfall rates. 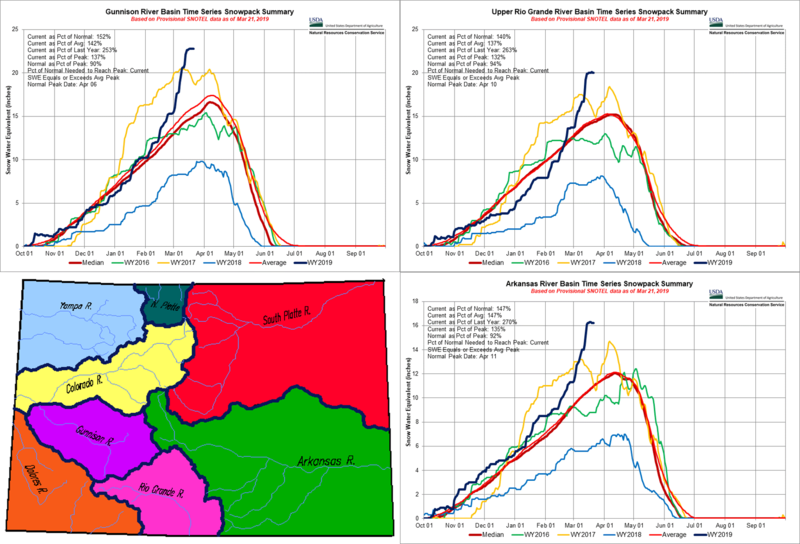 The 90-minute animations below takes place during the period of lowest pressure, and when snow became heavy (with 60+ mph gusts) in Colorado Springs (Figs 4 and 5). A tight circulation is found over far eastern Colorado, and the coldest cloud tops extend from Denver to Colorado Springs, and west. The NESDIS Snowfall Rate product, which derives snowfall rates from microwave satellite imagery from an array of satellites, confirmed the areas of heaviest snowfall during the peak of the storm. This product is particularly useful in data sparse areas, such as over the mountains. Further south, GOES-East split window difference (10.3-12.3 um) imagery captures widespread dust lofted by the strong winds across the southern plains on the backside of the system (Fig 7). Recall, negative values of this difference (brown here) highlight lofted dust particles. This imagery helps forecasters to identify the onset of dust being lofted and to track its evolution, and then communicate that information to the public and partners, and include it in forecast grids and text products.